In this article I am going to tell a little bit from my everyday challenges as “sword translator.” To start with, I have to say that when it comes to kanji or grammatical puzzles that I can’t solve (or that I am not really 100% happy with with my attempt at explanation), these things stick and are saved in that certain part of my brain that is still working pretty well. When it comes to swords, tsuba, or sword fittings, there is chance that I totally forget everything within some months or so because it is just too much, so you can pretty much embarrass me if you show me or ask me about a certain blade some time down the road and I totally forgot that I have ever laid my eyes on that piece. Anyway, let’s get back to topic. A little over a month ago I was approached about a cutting test inscription that contained a wording, or rather a certain character, that is relatively uncommon in tameshi-mei but which I had seen before. 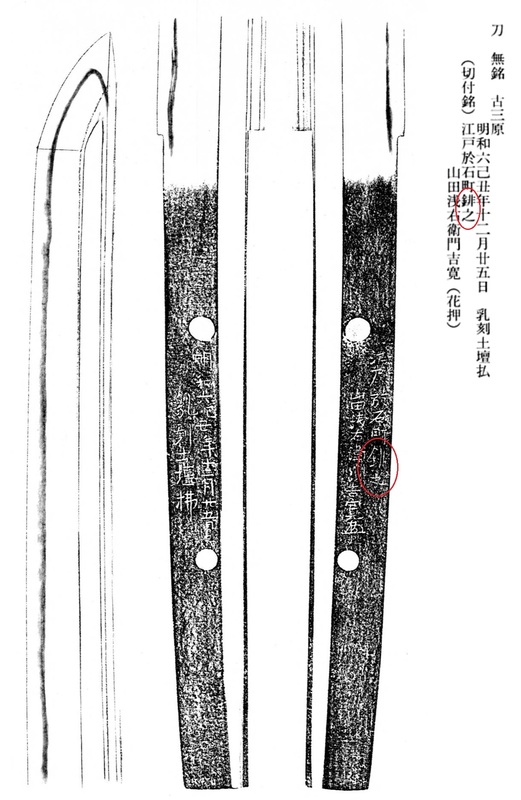 The mei in question can be seen in picture 1 and is found on a blade signed niji-mei “Masashige” (正重), either Sengo Masashige or Shitahara Masashige, with the style of the signature rather pointing towards the latter. 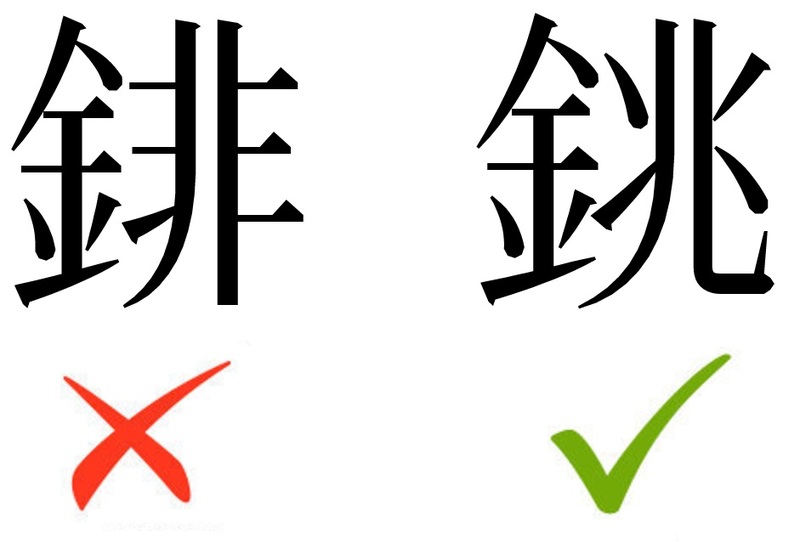 The tameshi-mei in question reads (於千手銚之貮ッ胴拂・壽尊) and everything but the one character is clear, i.e. “cut by [a certain] Toshitaka (壽尊) + kaô through (拂) two bodies (貮ッ胴) at (於) Senju (千住),” Senju being the place in Edo where most of the cutting tests took place. So only “problem” here is the character (銚). Well, I could have just left it as it was, end of story, but I don’t like the “should” part in my last sentence and so I kept going, trying to see if I can find more, and this article is so to speak a chronology of the investigation into that conundrum. First of all, I instantly remembered that I have dealt with this character once before, and that was translating a hozon paper for a katana by the Dewa shinshintô smith Nagai Kunihide (永居国秀), and that was back in 2013. This blade too bears a tameshi-mei but as I was only working with the paper (see picture 2), I was not aware about the subtleties in syntax and thought that I was facing here a name, Nabeyuki (銚之) (more on the readings of this character in a little), because it was mentioned in one go with the name of the guy who performed the cutting test, a certain Saitô Shin’emon (斎藤新右衛門) by the way. 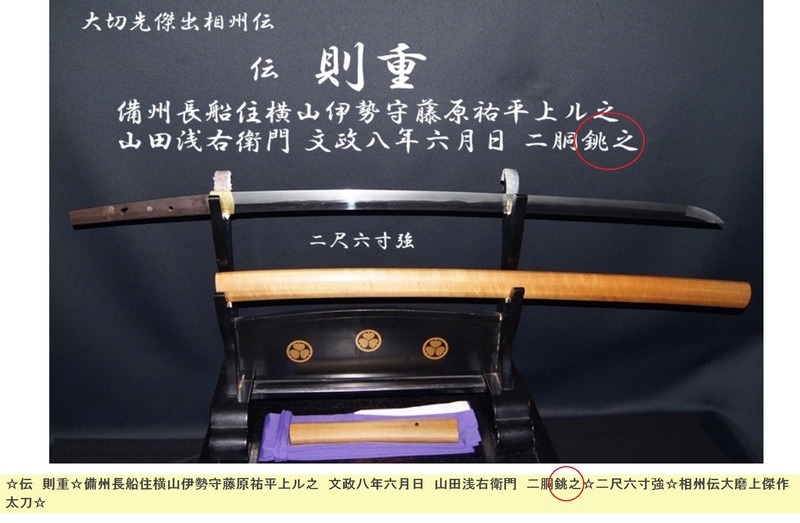 So having the same kanji and phrase (銚之) on a blade that bears a cutting test inscription too raised some red flags and I immediately had the hunch that it was not a name that I was facing translating the hozon paper four years ago. No sooner said than done, I started to dig into my references. Where else does this kanji or rather phrase appear? As I have a pretty decently organized archive, I made some finds right away, three to be precise, which I will introduce in the following. Lo and behold, they are all related to cutting tests. So in hindsight, we are obviously not talking about a name as I had interpreted the mei just on the basis of the hozon paper. First example, shown in picture 3, is a Norishige (則重) blade that was shortened by Yokoyama Bizen Sukehira (横山祐平) and tested by Yamada Asa’emon (山田浅右衛門) in Bunsei eight (文政, 1825). The syntax of the mei (二ッ胴銚之) suggests that in this case the kanji is used in the way of “cut,” i.e. “cut through two bodies.” Now “problem” with this blade is that when I saved it, from the winners-auction.jp website, the detailed pictures already did not load anymore so just the quotation of the mei has to be taken with a grain of salt, also because I am generally very cautious when it comes to auctions like that. The same applies to the auctioned blade shown in picture 4. Here we have another famous smith, Chôgi (長義), whose blade was again shortened in Bunsei eight by the same Yokoyama Sukenaga, and again Yamada Asa’emon cut with it through two bodies, what a coincidence (same seller BTW, *cough, cough*). 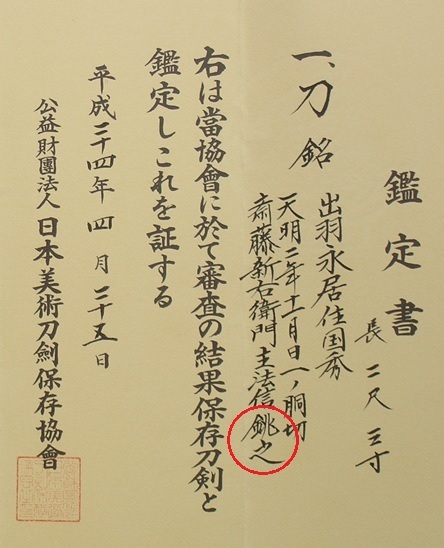 In this case however, the character in question was wrongly interpreted in the listing as being the character for “forged” (鍛), and the (clumsily written) sayagaki did so too. But I also have a watertight reference, and that is a Ko-Mihara blade that passed jûyô with which Yamada Asa’emon Yoshihiro (山田浅右衛門吉寛, 1738-1770), the 4th generation Yamada, cut through a body with the chiwari cut (see picture 5). The syntax of the cutting test inscription of this blade, (江戸於石町銚之), suggests that the character in question is read in this case as tamesu,. “Tested,” namely “tested in Kokumachi in Edo.” But before I continue with going into etymological considerations and my thoughts on this matter, I want to point out that the 1981 jûyô paper quotes the character in question as (䤵). I think it is actually still (銚) (see picture 6) because of the two lateral horizontal strokes on the nakago, instead of three, and the upward sweep of the right vertical “hook” of the radical (儿). In short, I think that the right part of this character is (兆) and not (非). So what is it now, “cut” or “tested”? First I tended 70:30 towards “tested,” tamesu/tameshi, because of the syntax of the blade introduced in picture 1 and the two wathertight, i.e. papered blades introduced in pictures 2 and 5. The character (銚) itself reads chô/jô/yô in its Sino-Japanese reading or nabe in its Japanese reading. It is the kanji for a certain small pot or sake bottle with handles. But it can also read suki and in this context, the character stands for “spade/plow.” Now no kanji dictionary lists this character as meaning “cut” or “test” (although some also say it can mean hoko, “spear” though) but I think that here we have to go to the etymological origins of this characters, which is “using a metal, metal tool/implement (金) to bisect (兆) something,” for example soil in the aforementiond meaning of “spade/plow.” Does that ring some bells, “metal used to bisect something”? Sounds pretty much like the definition of a sword to me. It has always been a pleasure and learning experience to read your article. I was just wondering if you could be so kind to enlighten a bit on the inscription 千手. You wrote it as 千住. I realise that both pronounce the same but are these 2 noun interchangeable and hold the same meaning in japanese? I am often curious and puzzled by some kanji words especially on inscription as they sometimes seems to have stroke that differ from formal writing. I have very little knowledge of swords and living in a land where there is no japanese swords to be found anymore, despite of being part of ww2 theatre. Thank you very much for the comment. It was a typo and should read (千手). Is corrected.